This is such a fun recipe. 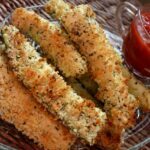 I made zucchini sticks years ago and had more or less forgotten about them, until I was staring down more squash this past week. I’ve made them twice since then and I am likely to make them again before the summer is finished. I’ve made them with and without the Parmesan (trust me, you want the cheese) and they are delicious. Crisp on the outside and roasted on the inside, just make sure they are fully cooked before you remove them from the oven. Note to self: Check with a fork next time. Having to toss them back in to finish cooking during dinnertime is never fun. Preheat oven to 425 degrees. Grease a large baking sheet or line with a silpat mat. Slice the zucchini and pat it dry. Combine the crumbs, cheese and seasoning in a small bowl. Sprinkle the zucchini with salt and pepper and then dip in the egg mixture. Press the egg-dipped zucchini into the dry crumbs on all sides, until the zucchini is completely covered in crumbs. 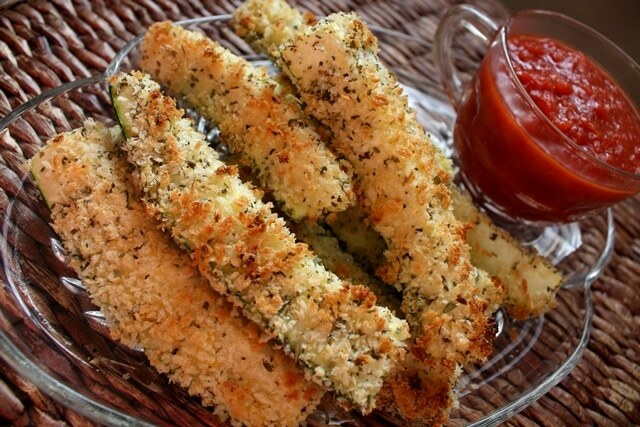 Set the breaded zucchini sticks on the baking sheet, skin side down. Bake for 20-25 minutes, until the sticks turn golden brown. How fun! They look so much like mozzarella sticks that they must be just as delicious! Thank you for this! I know everyone says you can use squash/zuchinni in "everything," but really? Ug. Not always true! My CSA box was chocked full of yellow squash this week. I'm gonna try this. I swear, everytime I look at this blog, I want to move in with you. Your family must eat like royalty! I fry mine...yours look perfect...and healthy. I just made these for dinner. Overall, not bad. I won't cut them into sticks next time though. The breading would not stick to the zucchini and it just slid off and burned to my sheet pan. I think I will just slice rings and top them with the parmesan/bread crumb mix. Definately needed more salt too. They were even hard to salt when cut into sticks. Sorry to hear that the breading didn't stick to the squash for you. I'm sure that zucchini rings would be delicious as well and very simple to make. Good luck!